After age 20, we all start losing muscle – and gaining fat. You can’t tell through scale measurements or by looking in the mirror how much body fat you have. By doing a DEXA assessment, you can immediately see changes in your body composition so you can be proactive with your health. It’s not your weight or body mass index (BMI) that matters, but your body fat percentage. Remember, measure body fat correctly and you manage body fat effectively. DEXA stands for Dual-Energy X-ray Absorptiometry. 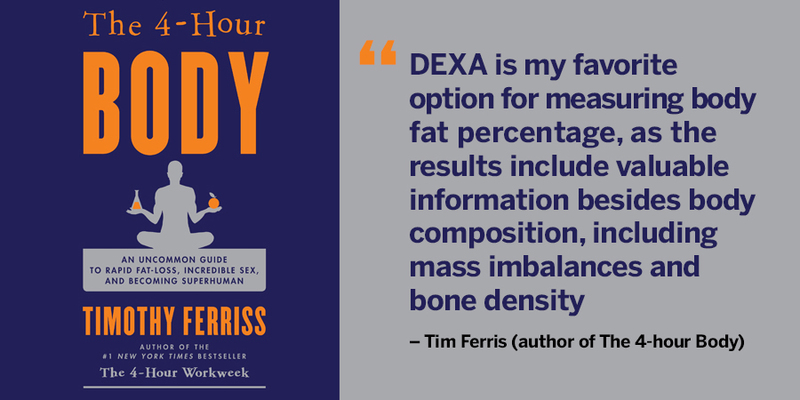 Athletes from The London 2012 Olympics, contestants on The Biggest Loser, Tim Ferris (author of the 4-hour Body), and the Green Bay Packers use DEXA Total Body Composition Studies to provide the benchmark for performance enhancement & to provide a graphic visual image of weight loss & changes in percent body fat. DEXA scans can be a powerful motivational tool for people tracking weight loss, nutrition, exercise, rehabilitation & overall health. Body fat percentage is superior to the currently accepted body mass index (BMI), as a measure of healthy weight. What is involved in a Total Body Composition Test Using DEXA Technology? The procedure consists of the patient lying down on the machine for about 6-12 minutes with a low dose x-ray. The procedure is totally painless. The client breathes normally but should remain still. The radiation is lower than a cross-country flight. Because there is a certain degree of radiation, female clients cannot undertake the scan if they are pregnant. Clients should wear clothing with no metal, zippers, or buttons. All jewelry should be removed. DEXA scans use a very low level of x-ray consisting of two different beams. One is a higher energy beam, while the other is a lower intensity. The lower intensity beam is only absorbed by soft tissue (muscle and fat), where as the higher intensity beam gets absorbed both by bones and by soft tissue. 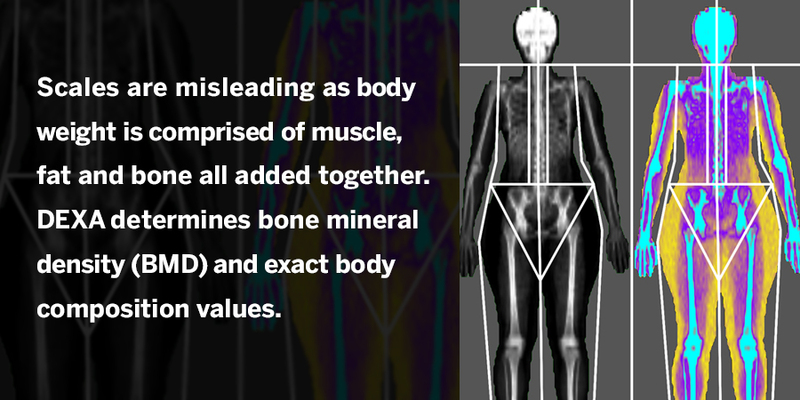 These differences in absorption are used to determine bone mineral density (BMD) and body composition values. 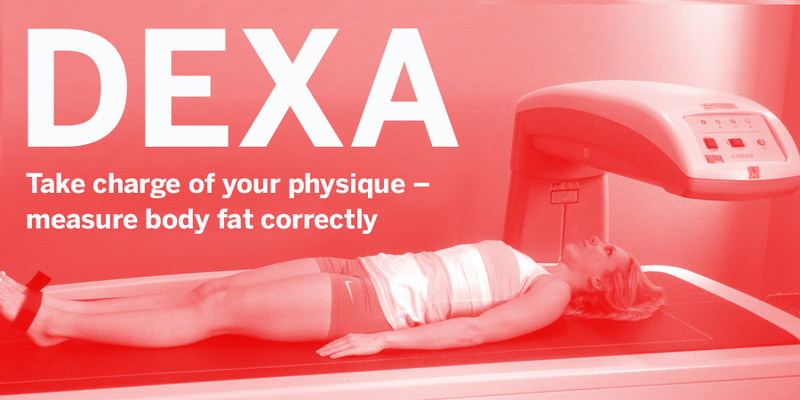 Why should you get a Total Body Composition Test Using DEXA? If you are trying to lose weight & want to monitor body fat loss and muscle growth from exercise, DEXA is an accurate measure of weight management and fitness programs. If you are proactive in your health and want to reduce the risks of heart disease, diabetes, high blood pressure, high cholesterol, cancer and obesity – a DEXA scan is a positive first step. If you are an athlete or bodybuilder and you’re trying to achieve a low ratio of fat to lean tissue mass, you can use DEXA to track muscle atrophy from injury, as well as muscle gain during rehabilitation. If you are interested in weight training and you want to monitor muscle mass, and want to get a fat scan and analysis for your health, DEXA scanning provides insight into your body's measurements. 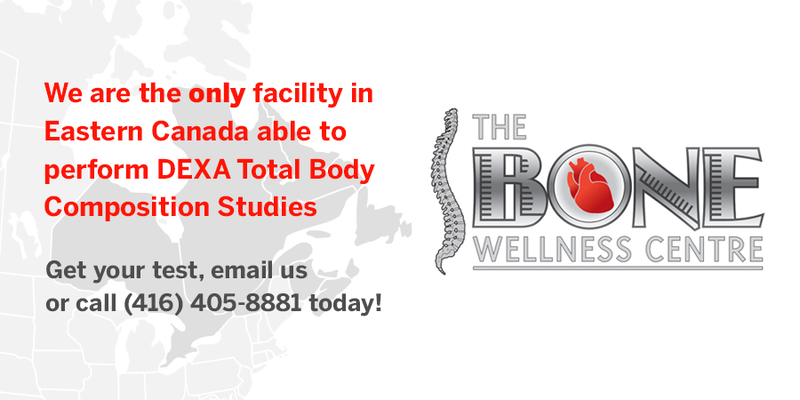 Get your DEXA at The Bone Wellness Centre, email us or call (416) 405-8881 today!